There’s a lot of talk today about Quora. It’s Robert Scoble’s fault, really. He had an opinion, changed it, and then it was up to the Internet to tell him he was wrong. Just a normal day around these parts. Personally, I don’t care how Robert Scoble uses Quora. I don’t really care how Robert Scoble does anything. Because he’s not a “normal” user – he’s an early adopter who uses things with the intent to break them, like the kid who asks for a toaster just so he can take it apart. It’s cute, really, but it’s not my intention. It’s probably not yours either. You don’t want to tinker. You just want the toast. If you’re not familiar with Quora – congratulations on avoiding the hype in favor of a life. At its core, Quora is a question and answer site not too much different from the likes of LinkedIn Answers. What makes Quora interesting for Scoble and the social geek squad is (a) the exclusivity it garnered as a closed beta and (b) how it’s turned being helpful into a competition and a quest for social capital. That’s great for the ego-obsessed, but what about just for you and me? How can you use Quora as a business owner? What can it provide you with in terms of research, competitive intelligence and helping you to connect with a larger audience? Well, a few things. If you’re reading this blog, there’s a good chance you’re involved in marketing, social media or tech, in some way. And, well, hot damn, if those aren’t three of the top user profiles using Quora right now. Following important subject area topics (like SEO or Web Marketing, perhaps), industry leaders, your competitors or even the people your competitors are following can prove to be highly informative, giving you access to questions, information or intel you can use later. If your competitor down the street is commenting on a thread and slipping hints about a project he may be working on or something he’s getting ready to release, wouldn’t you want to know that? If people are asking for a certain tool or expressing a common need, wouldn’t you want to know that, as well? It’s amazing what you can hear simply by keeping your eyes open. If you need help vetting social media, SEO or analytic tools, Quora may be an outlet to help you do that. Because answer quality is so high (and props to Quora for taking steps to make sure it remains that way), Quora has established itself a pretty solid resource for business owners of all sizes. I can’t tell you how many times I’ve seen people asking specific questions about a tool, service, etc, only to have the correct representative from that organization chime in to answer. You can’t get much better than that. It’s like Twitter, but without that pesky character count. The conversation happening on Quora is a lot smarter than what’s taking place on other question and answer sites and that’s 100 percent the work of the Quora staff. Not only have they done a good job killing spam, they actually require users to go through a quick tutorial before they’re allowed to ask a question (blog owners everywhere wish they had this functionality). It trains them on how to use the site and has helped keep the quality up. What that means is that if you ask a smart question (especially if it’s tech-related), you’ll get a smart answer back without the required “your mom” joke from the Internet. On the flip-side, if you see a smart question and you have a smart answer, sharing it with the group is a good way to not only increase your social capital, but your reputation as an expert in your field. It’s what these Q&A sites are based on. Sabre often jokes with me that I see the world in blog topics and blog titles. And I do. It’s an occupational hazard that hit me years ago. But if you’re someone who is always on the hunt for something new to write about and to cover, then scouring your important subject areas on Quora can help you come up with a breadth of ideas. Take a look at the type of questions people are asking. What are the common themes? What are they struggling with? What tools or workarounds are they looking for? What has them riled up? It’s a constant content source. Call it online reputation management or simply paying attention, but Quora gives you an opportunity to highlight conversations about your brand, your company and your executives and to get involved in them. A few quick OSM-related searches on Quora brings up users naming Outspoken Media as a top social media blog, a top copywriting blog, myself and Rhea as top female SEO professionals, and lots of other brand mentions. How did I first alert myself to these mentions? Through my Google Alerts. Which means, hi, these questions are already being given the authority they need to rank. In fact, they’re ranking pretty darn competitively. So maybe you should look for brand mentions and get in some of these conversations. 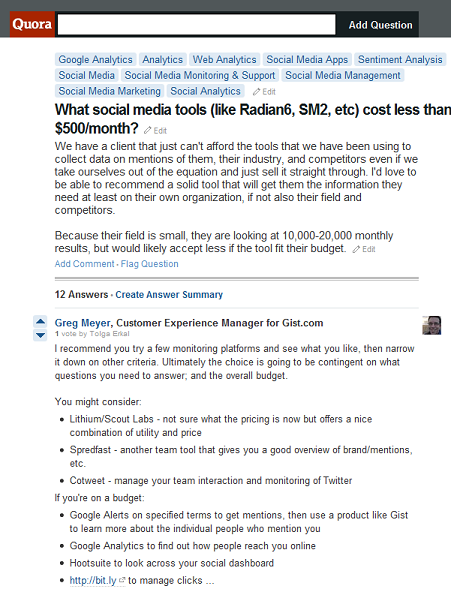 To make it even easier, if your brand gets a lot of mentions, it may already have its own Quora category. If so, simply follow it to be updated every time you get a new hit. Fancy. Will Quora survive in the face of LinkedIn Answers, Yahoo Answers and the bad people (read: SEOs and marketers) who will ultimately try and turn it into a haven for spam, SEO whoring and self-promotion? Well, we’ll see. But let the pundits worry about all that and whether Quora deserves its social media crown. For business owners, Quora is another place where your customers are asking questions. The questions to ask yourself is: Are you smart enough to pay attention to answer them? Are you keeping your finger on what’s going on and recognizing these new platforms, are you still waiting for people to check out your site’s FAQ page? Quora and sites like it represent a new era of users seeking out brand- and topic-specific information. That’s what matters. Not what the social media hipsters have to say about it. What are your thoughts on Quora? Using it? Ignoring it? Never heard of it?